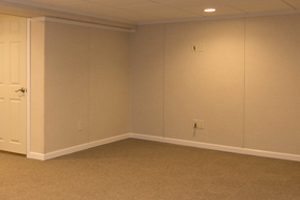 New England's Basement Finishing ExpertsAdd Value, Warmth and Comfort to Your Basement Today! We offer customizable and mold resistant tiles that don't hinder accessibility to plumbing and wires. 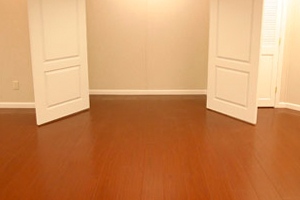 Our flooring products are designed just for basements. They are durable, mold and water resistant, and look great. Our Products are designed with damp basements in mind. They are far more durable than other products on the market and resist mold and water damage. Our Team is certified and trained in all our products. You can expect quick and masterful installs and services. If you are looking for extra storage space, or an in-home gym, we can provide you with the living space you've been looking for. We will come to your home to take measurements and listen to all your expectations to make sure you are getting exactly what you want. 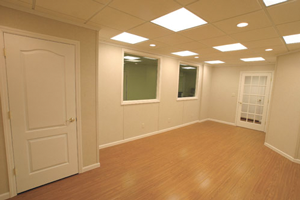 New England Total Basement Finishing uses products developed by Total Basement Finishing. Our system includes a 50-year wall warranty and a 30-year ceiling warranty. Our clients have peace of mind knowing that their finished basement is durable and long-lasting. The Total Basement Finishing System is a complete basement renovation package. We offer waterproof flooring, mold resistant ceiling tiles, and wall panels strong enough to mount a television on. You will love what we have to offer. When having your basement finished by us, you can look forward to amazing products. 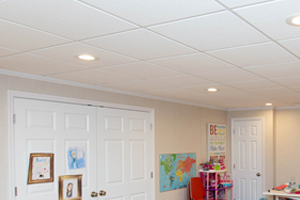 We use mineral fiber drop ceiling floor tiles. These tiles are easy to install and clean. They also have sound-deadening qualities. Our specialized flooring tiles are inorganic and create a thermal effect so that you don't feel the cold basement floor. They come in a variety of styles and colors that recreate the look of wood planks or even carpeting while remaining resistant to water damage. Our wall panels don't require any framing, studs, or painting. Our walls are insulated and have an R-13 rating. Your basement is finished as soon as they go into place! New England Total Basement Finishing is a local basement contractor that has been in business since 2007. On top of our own experience, we are also backed by the Total Basement Finishing expert network. We know there is no situation that we can't handle. No matter the living space you are asking for, we have the products and experience you need. You can ask for a man cave, in-law apartment, or a family room. Our team can convert your damp and dark basement into the room you've been dreaming of. Have you considered putting a bedroom in your basement? Many homeowners don't realize that they make a perfect bedroom because they are private and quiet. They are also easy to heat and cool. If you have extra space, you can expand it into a full apartment. This a quick way to help with household expenses or give a family member a comfortable place to stay. If you are just looking for some extra space to entertain, don't let your basement go to waste. You can add a bar for socializing with friends, or create an in-home theater. The basement's atmosphere adds to the listening experience. Your imagination is the only limitation to the potential your basement holds. So if you've been thinking of making the most of your basement and you're in the Boston, Quincy, Brookline area, call New England Total Basement Finishing for a free estimate today!